Red Heather Campground. Perfect jump off point. Red Heather. The name conjures up memories of nice evenings with the campfire casting a glow against the nearby evergreens and the wonderful scent of the heather filling the meadow surrounding the campsite. Red Heather campsite is the best way to describe it, rather than a campground. It’s quite small. Turn east off Hwy 99 onto Mamquam Road, 4 km north of the Squamish town site. Follow the paved road past the Squamish Golf and Country Club and then take the gravel road just past the Mashiter Creek Bridge. The road is generally full of potholes so take it easy. It is graded occasionally. It is 16 km from the highway to the parking lot, located at 914 meters. You should stop at the lookout 1 km before the parking lot that provides a sweeping, panoramic view of the Squamish River Valley and Howe Sound. All camping areas, cabins, shelters, etc. in Garibaldi Provincial Park are operated on a first-come, first-served basis. If you are there first, you get to stay. No reservations are accepted. Be prepared to camp in outdoor conditions if the shelter facility is full. 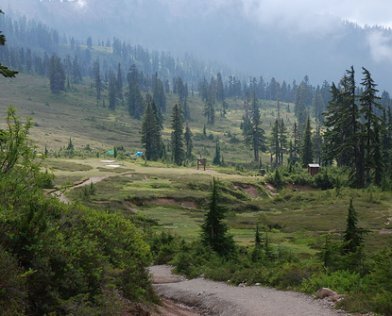 Camping is restricted to Elfin Lakes, Red Heather and Mamquam Lake Campgrounds. Camping and Shelter fees are charged year round and must be paid in full at the trailhead Fee Station. Proof of payment must be carried at all times while in the park. A box is provided at the parking lot for your payment. Red Heather - Located 5 km from the parking lot, the Red Heather area offers a day use shelter equipped with 2 picnic tables, a propane hot plate, a wash sink, a cooking counter, a wood stove (winter use only) and pit toilet facilities. Please take it easy on the wood to ensure that wood supplies last through the winter season. Camping is not permitted in the shelter. On snow camping is permitted during the winter season only. Nearby is a small campground with tent platforms. Red Heather is about an hours walk with a backpack from the parking lot. The shelter is nearby. The shelter is the home of families of field mice. On a rainy evening we set up our little stove to cook supper. As soon as we were a little quiet the little mice suddenly appeared. They scurried everywhere, curious as all get out. The campsite was perfect as the platforms kept us above the rain soaked ground and we remained nice and dry. The sounds of the owl’s hooting nearby was amazing. It continued for hours. The next morning we headed off to Elfin Lakes where we managed to get a couple of bunks in the Elfin Lakes Hut. This is a real bargain at $10. Per night. It even is equipped with propane stoves. This site is cared for by a Ranger who is on site for the season. The heat in August can be quite unbearable as there is not much in the way of shade. The nice cool waters of the lakes are perfect to cool one down. If you are really into hiking you might want to climb your way up to the saddle you can see from the lakes and hut. The view from there is spectacular. You might want to make sure you place some rocks inside your tent if the wind is blowing as it could literally blow it away at times. Another 7 miles of a hike will bring you to the Mamquam Lake remote campsite. Again there are a few tent platforms and plenty of hiking adventures everywhere. One important note. The Garibaldi Park is a carry in/carry out park. Take your garbage home with you if you please.